국보 제140호 나전 화문 동경(2014년 국보 동산 앱사진). 가야 지역에서 출토되었다고 전해지는 나전기법으로 만든 거울로 지름 18.6㎝, 두께 0.6㎝이다. 우리나라에서 발견된 가장 오래된 나전 공예품으로, 이와 같은 나전기법으로 만든 거울이 일본 정창원에 보관되어 있어 특히 주목된다. 거울 뒷면 가장자리에는 둥글게 구슬모양의 띠를 두르고 그 안에 작은 꽃모양들이 있고, 꽃잎 안에는 호박을 박아 놓았다. 뒷면 전체에 화려한 모란문을 장식하고 좌우에 각각 사자와 새를 배치하였는데, 문양 사이에는 두꺼운 칠을 한 푸른색 옥을 박았다. 정창원 소장 나전거울과 유사한 8~10세기 경에 만들었을 것으로 추정되며, 우리나라에서 가장 오래된 나전 공예품으로서 가치가 있다. The mirror (diameter of 18.6cm and thickness of 0.6cm) is said to have been unearthed from an area that used to belong to Gaya. 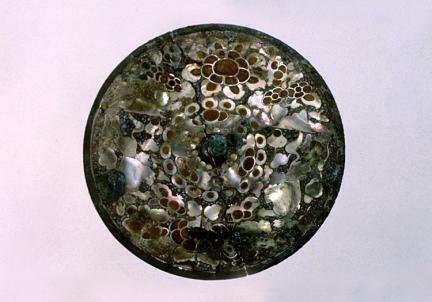 It is said to be the oldest handicraft made of inlaid mother-of-pearl found on the Korean Peninsula. Noteworthy is the fact that a mirror made with a similar technique is kept at Shosoin of Japan. The edge of its backside is adorned with a bead-shaped round strap containing floral patterns. A gorgeous peony pattern fills the backside, with birds and lions portrayed at the sides. Blue jade is inlaid between patterns. The object was believed to have been made sometime between the 8th and 10th centuries. 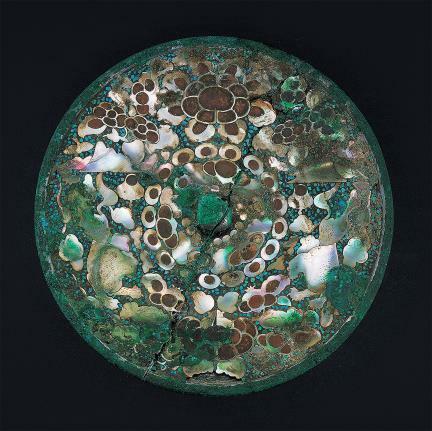 It is a precious item as the oldest handicraft made of inlaid mother-of-pearl found on the Korean Peninsula.